Derek Holmes keeps getting better. Derek Holmes was an All-American runner competing in the 4x800 and distance medley relays at Marshfield High. But the transition to running the 8-kilometer race as a collegian is not easy. But at the America East Cross-Country Championship Oct. 27, Holmes was the third UMass Lowell runner to cross the finish line, placing eighth overall, as the Riverhawks nosed out Stony Brook by a single point for the team title in rainy and windy conditions at Mine Falls Park in Nashua. Grad student Paul Hogan (Burlington) was first, sophomore Ben Drezek seventh, and Holmes, also a second-year, edged a Vermont runner at the finish line for a 25:00.4 finish in the 5-mile race. “Derek is a really good competitor. When he came here, he didn’t have a lot of confidence in [the 8-kilometer race] and cross country . 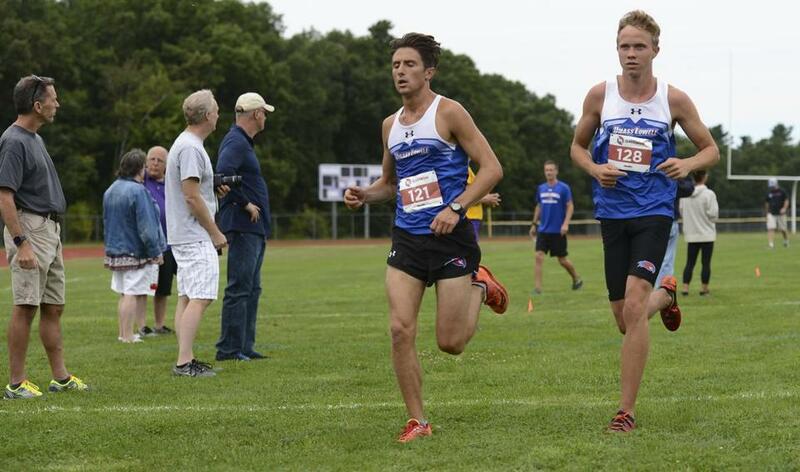 . . Now, he’s confident in anything from the mile to the 8k, and will be racing in his first 10k this Friday,” said UMass Lowell coach Gary Gardner. As a freshman, Holmes finished fourth at the New England Intercollegiate Amateur Athletics Association race and ninth in the 5K at the 15th Central Connecticut State University Mini Meet. During the outdoor season last spring, he won the 800 at the UMass Lowell Invitational. A civil engineering major, Holmes took a few minutes away from the course for a few questions from the Globe. Q: When did you decide to first start running? A: I came out for the spring track team in my sophomore year [at Marshfield]. I started as a sprinter and I switched to distance because I stunk at it, and it just carried on from there. I ran this road race in Marshfield and I beat all the other sprinters. I took it as a sign that I should try it out, and I ran the mile at the next meet. Q. How did it feel to be an All-American at Marshfield? A. It was one of my favorite things I’ve done in high school. [Relays teammates Mike Maglio, James Condon, and Joe Donovan, and I] were all relatively the same age, and we all moved up together. Finally getting the pieces together at the end was probably one of the most rewarding things I’ve been able to do. It’s funny, we all pretty much lived right by each other. We were a really close-knit team. Q. What is the most difficult class you take at UMass? A. Surveying. There’s a lab and a regular class for it. In the lab, we go out and do field work and learn how to use equipment for civil engineering. The lab is really interesting but a lot of work. In class, it’s a lot about calculating error and [learning] different methods to calculate things. Q. What have your teammates taught you? A. Hard work really pays off. Not all of them were as gifted as some other kids were when they first started out. They just seemed to put in the work and get better as they went. Q. Where is your favorite place to eat at UMass Lowell? A. Probably Suppa’s Pizza, it’s a great place to go after practice if the dining hall is closed or after I get home from a meet. They have great buffalo chicken pizza, it’s one of my favorites. Q.Do you still get those pre-race jitters? A. I definitely still get those, I think it makes me a better runner. If I don’t have those, it’s almost like I don’t have my adrenaline pumping. I feel like that’s what puts me to the next gear. Q. Was there anyone back home in Marshfield that influenced you the most? A. Obviously my parents, James and Patricia Holmes. I wouldn’t have gotten to [UMass Lowell] without them. My coach [Dennis Sheppard] really affected my high school running and where I chose to go to school in the future. He really affected my path. Joe Rice conducted this interview. He can be reached at joseph.rice@globe.com.